This article is about the cavern. You may be looking for the synthesis material. The Cavern of Remembrance is an area of the world Radiant Garden that was introduced in Kingdom Hearts II Final Mix. It is filled with extremely powerful Heartless and Nobodies, and also focuses strongly on the use of platforming in opposition to the rest of the game. The main attraction of the area is the Organization XIII's Replica Data battles contained at its terminus. The hole in the castle wall at the Postern reveals a broken ladder leading into the Depths (最深部, Saishinbu? ), which at first appears to be small cave with a stream of water pouring down a high ledge, next to a Valor Form crystal. However, past the ledge is a short tunnel leading to an immense, beautiful crystalline cave, containing many ledges, stalactites, and stalagmites which can be ascended to reach an ornate door, as well as a healthy population of powerful Heartless. Through this door lies the lowest part of the Mineshaft (坑道, Kōdō? 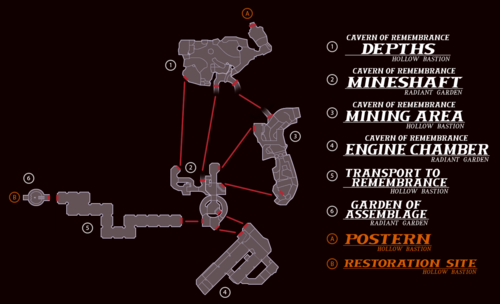 ), a deep, winding pit cave which is crisscrossed with pipes across multiple "floors". Each floor contains openings in the pipes that require specialized Growth Abilities to traverse, as well as the appropriate Drive Form crystal for each obstacle; the first two are also guarded by event battles with several waves of Heartless. Crossing the first chasm with Quick Run brings Sora to another ornate door, as well as a passage leading to an upper cubby of the Depths, where he can dislodge a stalactite in order to create a shortcut. The second floor of the Mineshaft, which can be accessed through the Mining Area, and has pipes can be bypassed with Aerial Dodge in order to reach an additional door to the Engine Chamber. Both the door and the cubby lead to the Mining Area (採鉱部, Saikōbu? ), a complex area of pistons, vents, and engines that is initially inert. By activating the engines lying at the very bottom of the chamber, Sora awakens the powerful machinery that he must negotiate to reach the next door. Through this door is the busy Engine Chamber (機関部, Kikanbu? ), filled with conveyor belts, pistons, scalding jets of steam bursting from pipes, and more powerful Heartless, as well as several hidden balconies. At the end of this is another door and another section of the Mineshaft, with a final pipe obstacle which must be threaded using Glide. Exiting the cavern through this door brings Sora to the Transport to Remembrance (追憶への誘い, Tsuioku e no Izunai?, lit. "Invitation to Remembrance"), a long balcony hallway built in the same style as Castle Oblivion, with Radiant Garden's characteristic inverted waterfalls against the open sides of the path. The hall is filled to bursting with powerful Nobodies, and Sora's initial traversal of it requires him to conquer three separate event battles, each with multiple waves of Nobodies. The final door brings him out of the subterranean caves to the Garden of Assemblage (集積の庭園, Shūseki no Teien? ), an ornate mall in the style of the Castle That Never Was surrounded by a circular wall, which is itself ringed by more of the inverted waterfalls. At the center of this mall lies a computer, which can be used to bring out the thirteen Organization XIII's Replica Data battle-simulation chambers built into the fall's cliffs, as well as to open a secret passageway, veiled by an illusion, back to the Restoration Site. The balloons filled with Drive Orbs at certain points of the Cavern of Remembrance indicate that Sora must use the Drive Form abilities to get past a certain area. Sora needs to use High Jump (acquired from Valor Form) to get over the wall at the entrance (hence the red coloration). At the entrance of the Mineshaft, Sora needs to use Quick Run (acquired from Wisdom Form), hence the blue coloration of the balloons, and so forth. Whenever Sora enters into the corresponding Drive Form, the balloons light up. These balloons drop large quantities of Drive Orbs when attacked, making them ideal for leveling Master Form. After the Transport to Remembrance is cleared the first time, the enemies that spawn within will vary each time the room is entered. Sorcerers, Snipers, Dragoons, and Creepers appear in one group, while Berserkers, Assassins, Dancers, and Samurai appear in the other. It is possible to go through the Cavern without actually getting the High Jump ability or the Dodge Roll ability. One just needs to have Aerial Dodge and Glide, for if they fall at the entrance and climb up the rocks in the first room. Also, Master Form's Aerial Dodge will enable the player to jump to the door of the first area of the Cavern[please confirm] without touching the ground level, preventing Heartless from spawning in that room. The portals in the Garden of Assemblage activate after the episode attached to their member is cleared. For Absent Silhouettes, this only requires defeating the Absent Silhouette, while for the members that are fought in-person, this requires completing the entire world episode they appear in; thus, the five portals matching the members fought at The World That Never Was do not activate until the game is completed. Shortly after Sora, Donald Duck, and Goofy hear an explosion coming from outside the castle, they run to the entrance and find a hole in the nearby pillar. They see Yuna, Rikku, and Paine flying out of the hole. Sora is curious as to what is inside the hole, but Donald yells at him, telling him that they can check the area later, and that they have to go after the King, as the Heartless are invading. Sora may access the Cavern at any time after this. Sora, Donald, and Goofy at the entrance of the cavern. The computer used to activate the doors.